The Ohio Seventh was a regiment from northeastern Ohio that enlisted as soon as the Civil War began for a three year term. During their tenure, they fought in many major battles including Gettysburg, Cedar Mountain, Lookout Mountain, Missionary Ridge, and Missionary Ridge on both the Eastern and Western Campaigns. They are considered by many historians as the most heroic regiment. The Ohio Seventh were sometimes called the Rooster Regiment because, when they went into battle, they crowed like roosters. They were also known for their temperance. The leader, Colonel Creighton, was a Christian and didn’t allowing drinking, gambling, or soliciting prostitutes among the ranks. One company of the regiment came from Oberlin College. Oberlin was known for its abolitionist views and religious fervor. Charles Finney, the president of the college, had been one of the preachers of the Second Great Awakening. Because most of the regiment strived to live Christian lives even in the midst of war, they were also sometimes called the Praying Regiment. Even with all their victories, the regiment came home after three years feeling defeated. Their last major battle, Ringgold Gap, was their worst. After two days of victories in Lookout Mountain and Missionary Ridge, the Seventh was ordered to chase the Confederate soldiers to Ringgold Gap. The Confederates stopped running and set up an ambush. Colonel Creighton, their leader died while trying to rescue Lieutenant-Colonel Crane, the man who had been his close friend, but it was too late. Crane was also killed by enemy fire. When the battle was over, every officer in the regiment except four were wounded or killed along with many enlisted men. Colonel Creighton, who was loved by his men, left a young widow he had married a few days before the war. Very few of the men who were left reenlisted although a few joined Sherman's march to Atlanta. I wrote Soldier's Heart, a novella about a man who had served in the Ohio Seventh, to show how hard it must have been for a man returning to his hometown after a defeat like that. 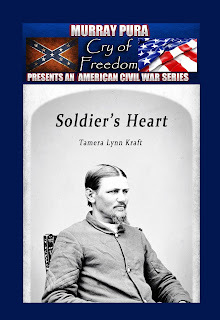 PTSD during the Civil War was called Soldier’s Heart, so it became the title of my story. It is about how a Christian soldier would handle PTSD and how hard it would be for the family left behind to understand what the returning soldier is going through. Even though the setting is the Civil War, PTSD still resonates with many military families today. Now we have a better understanding of how to treat people with PTSD, but in past wars, many of the returning soldiers suffered in silence, and their families didn't know how to help them. To be entered in the drawing for a free paperback copy of Soldier's Heart, click the link at the end of this post and follow the directions. After returning home from the Civil War, will his soldier’s heart come between them? Noah Andrews, a soldier with the Ohio Seventh Regiment can’t wait to get home now that his three year enlistment is coming to an end. He plans to start a new life with his young wife. Molly was only sixteen when she married her hero husband. She prayed every day for him to return home safe and take over the burden of running a farm. But they can’t keep the war from following Noah home. Can they build a life together when his soldier’s heart comes between them? Soldier’s Heart is available in e-book or Paperback. To enter the drawing for a free paperback copy of Soldier's Heart, click the link below. The contest will end in one week. Over the years before PTSD became something dealt with medically, it seems as if families would just say, "He/she just wasn't "right" after the war," or some such. I think the soldiers have always just been accepted back into families and their symptoms were coped with. Some soldiers became and still become like hermits, isolating themselves. Thanks for your comments, Connie. I think it's sad soldiers with PTSD are welcomed back the way they use to be. Sounds like a great book. I never knew this about the Ohio Seventh. You don't have to be a veteran of war to suffer from PTSD. Victims of crashes can also suffer from it. I love historical fiction. Thanks for the chance to win. Thanks, Janet. You're right that PTSD affects non-soldiers too. I knew a young man who served in Vietnam and he was affected with PTSD. He was never able to adjust after his return and he died very young. His family tried to help but PTSD was still new to many people at that time. During civil war times PTSD was something that people didn't know how to treat. Illnesses of the mind were just something they didn't know how to treat and still have trouble treating but they do have a better handle on it now, Back then for unknown illnesses people were put on bed rest as treatment. With illnesses of the mind isolation was and still is common. My great-great-grandfather's unit was not so illustrious. They were never in battle, and the only deaths were by drowning or disease. They still joined to fight with honor, Terri. I had no relatives in the civil war. But I did have a grandfather who served in WWI and a Uncle who served in WWII. I myself deal with PTSD due to childhood trauma. Thanks for your comments, Kim. My father and father-in-law also served in WW2. I love to learn new things about this country's history. This was a wonderful bit of Americana unknown to me so thank you for the great info. I like how you tied today's PTSD epidemic (and it is a military epidemic) with the soldier's conditions back then. The mental status of our military people is an important topic and now we have many women soldiers on the battlefield as well. Good job! Your book certainly has peaked my interest. I hope you enjoy my book, Marlene. 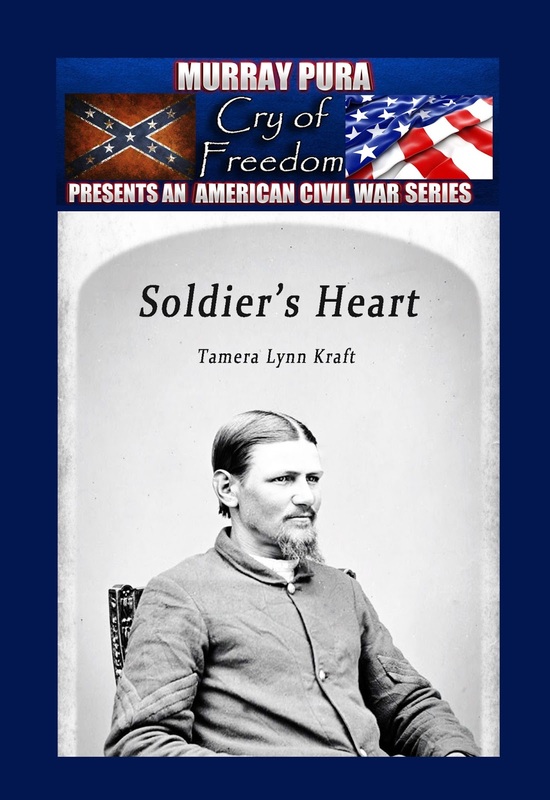 Even after writing 2 Civil War era stories, I had not heard the term "Soldier's Heart." How touching ... thanks for this post and the incites regarding the Ohio Seventh. Your story sounds unforgettable. A son of a friend came back from Iraq with PTSD which he is struggling with while raising his daughter. I'd love to read more about it and how it affects people since I'm currently writing a novel about a WWII German soldier in a prisoner of war camp in Minnesota. This might give me an idea of what he'd be going through. Interesting perspective with your story, Connie.